Dave and I recently visited Wales and on our first morning in Little Haven where we were staying we went for coffee at The Saint Bride’s Inn. Together with our coffee we shared a slice of bara brith. The owner asked where we were from and Dave told her Cape Town as its the biggest city closest to where we live and therefore the most likely of places people will know. She then said ‘oh, our daughter-in-law’s family is from Gordons Bay’. What a coincidence. And we know them! The world is such a small place. Our trip continued in this vein, with meeting people who had been to South Africa, and meeting people who were friendly and chatty and curious about where we were from. The one thing I was curious about was Welsh Rarebit. I had heard of this but never tried it. So, when in Wales …..
One day we found ourselves at Nant y Coy Mill alongside the Treffgarne Gorge. The mill was built in 1326 and was used to grind corn. We decided to stop there and take a look at the waterwheel which is no longer working, and have lunch. We shared a Gwynt y Ddraig (Black Dragon) Perry Vale Cider, and for lunch I had Welsh rarebit. At a cost of £7.00 (R126) this was something I knew I could make at home, and for less. 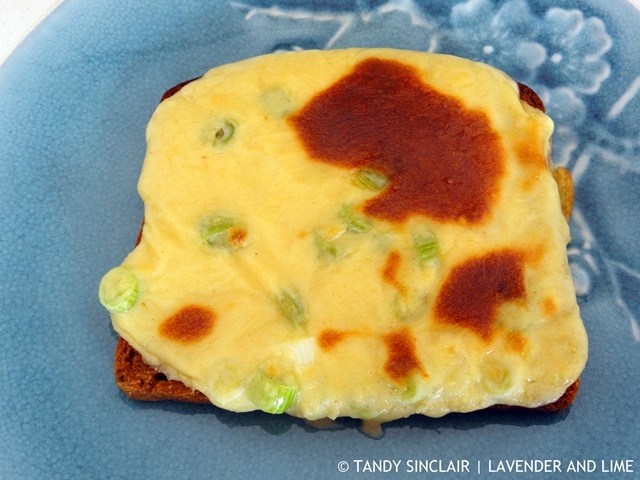 What I did not know is how easy Welsh rarebit is to make. This is a lunch time meal that has been repeated a few times already. Do you try local food when you are travelling away from home? This cheesy bread topping will become a regular lunch time meal that is hard to resist and easy to make. yum yum yumm! Simple yet tasty! Growing up, this was a favorite breakfast in our house! Such an amazing coincidence! My husband is from Wales, and he is the Welsh Rarebit expert in the family. It’s the perfect comfort food. Your trip to Wales just must be amazing! Would love to visit there…someday. We definitely eat local when on vacation. We avoid the “all inclusive” resorts when possible. SO much fun to eat local and enjoy what the locals eat! I love a bit of Welsh Rarebit. Very naughty kj wise but absolutely delicious! What a wonderful trip, Tendy! Your delicious Welsh Rarebit sound like the Welsh version of Croque Monsieur. Wishing you and your Family a very Happy Holiday Season. Haven’t made this for ages – first made when I was doing Home Science at Otago University! Must make it again – thanks for the reminder Tandy. I think the local restaurants are the best! I love Welsh Rarebit, together with a bowl of green salad it makes a lovely lunch. My mum taught me to sprinkle some white wine on the bread and add the mustard on top before spreading the cheese mix. Welsh rarebit is so fabulous in all of its cheesy deliciousness!